Australians Andrew Chan and Myuran Sukumaran have eaten their last meals. Kissed their families for the last time. Inhaled their last breaths. They have been shot in front of an Indonesian firing squad. Australia has waged a protracted diplomatic battle to keep the two men alive but that battle has failed. The plight of 31-year-old Chan and 34-year-old Sukumaran on death row in Indonesia has gripped Australia in recent months. Most here, including human rights groups and politicians of all persuasions, are appalled by the death penalty. And yet these were not innocent men, by any stretch of the imagination. Following a tip-off from the Australian Police, (yes, that's right) they were convicted in Indonesia in 2006 of being the ringleaders of a gang trying to smuggle drugs out of Bali. But 18lb (8.3kg) of heroin, worth more than US$400,000 at today's street value. If that heroin had made it back to Australia it would have contributed to hundreds of shattered lives. Teenage drug addicts found dead in back alleys, needles hanging from their arms, choked to death on their own vomit; grieving mothers, fathers, sons and daughters. Back in 2005, Chan and Sukumaran presumably didn't care about those lives. They just wanted the money. They didn't care too much about the risk either. They were prepared to smuggle drugs out of a country notorious for its harsh treatment, including execution, of drug dealers. They probably felt differently lately. But did they deserve to be executed? Most people in Australia, and for what it's worth, myself included, think not. Their supporters, and the Australian government, argued the two men appeared to have realised the error of their ways and reformed. Chan's last wish was to be allowed to attend a church service. This week, he married his girlfriend. While in jail Sukumaran taught philosophy, English and graphic design to his fellow prisoners. But in just about every country in the world, people agree that major league heroin dealers, even those who acknowledge their guilt, should be severely punished and banged up for a long time. And there is a double standard with the story of Chan and Sukumaran. With their case, and with other Australians put to death elsewhere in the past, the government in Canberra has strongly protested against the use of capital punishment. It has usually happened in countries similar to Indonesia: for example, Malaysia executed the Australian heroin traffickers Michael McAuliffe, 38, in 1993, and Kevin Barlow, 28, and Brian Chambers, 29 in 1986. Singapore executed 25-year-old Van Tuong Nguyen in 2005, hanging him after he was caught with heroin strapped to his body. There always seems to be an assumption in the west that foreigners convicted in these countries are innocent, or that the justice system or the police involved are corrupt. In the case of Chan and Sukumaran, some of that might apply. There are unsubstantiated allegations Indonesian judges offered to give the two men a shorter sentence in exchange for a bribe of about A$130,000 ($102,000; £67,000). But Australia doesn't make too much of a song and dance about non-Australians being executed. It doesn't make a point of criticising the United States, which has shot, electrocuted, hanged or poisoned to death more than 1,400 prisoners since 1976 and where more than 3,000 people are currently on death row. Australia doesn't care too much - or not enough - to cut off trade ties, with China, which by most estimates, executes thousands of people every year. Since elected, Australia's Prime Minister Tony Abbott has talked warmly of Australia's friendships with China, Indonesia and Japan - all countries that execute criminals. Despite huge efforts it has not been able to dictate to Indonesia what to do. Australia's recall of its ambassador may last for some time. There will likely be harsh words from Australian ministers in hastily convened press conferences. But I suspect, pretty soon, relations will drift back to normal. Australia needs Indonesia. Much of the Australian aid that heads to Jakarta goes towards anti-terrorism measures and efforts to tackle people smugglers. Australia will not want that to stop. 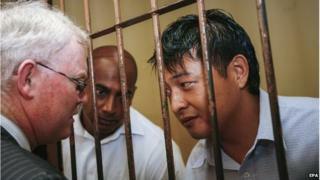 There has been a great deal of sympathy here for Andrew Chan and Myuran Sukumaran. But give it a few months and it is likely Australians, the government included, will be turning a blind eye when Indonesia continues to execute people who don't hail from the land Down Under.